Slovenia is a tiny little Balkan country surrounded by Austria and Hungary in the north, Italy in the West and Croatia in the east and south. With a sparse population of about 2.3 million people and a geographical expanse of just above 20,000 sq kilometres this ex-Yugoslavian gem is easy to mingle around and navigate. 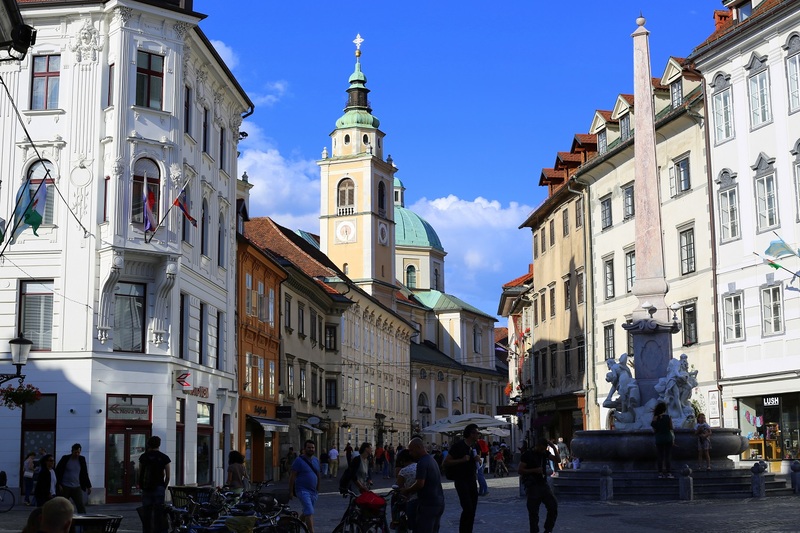 If you base yourself in the capital city of Ljubljana (voted as the Green Capital of Europe 2016) the main attractions in the south-north and east-west directions take only about 1-2 hour car rides. This allows you to go around the whole country probably within a week! The best part of travel here is that it is still not a crowded destination and I do not see a possibility of huge crowds (even in summer) within the next five years. 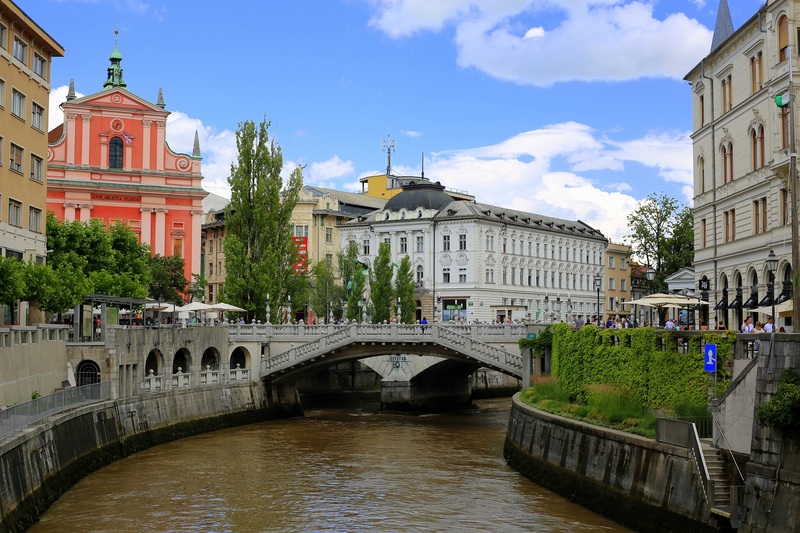 The capital city itself may not be a big draw when it comes to must-see places but the relaxed way of life along the river Ljubljanica and the eye-catching baroque and Renaissance-style buildings in the winding streets of the Old Town are definitely something to experience and envy. It would be a good idea to cover this city on the last two days of your Slovenia trip. 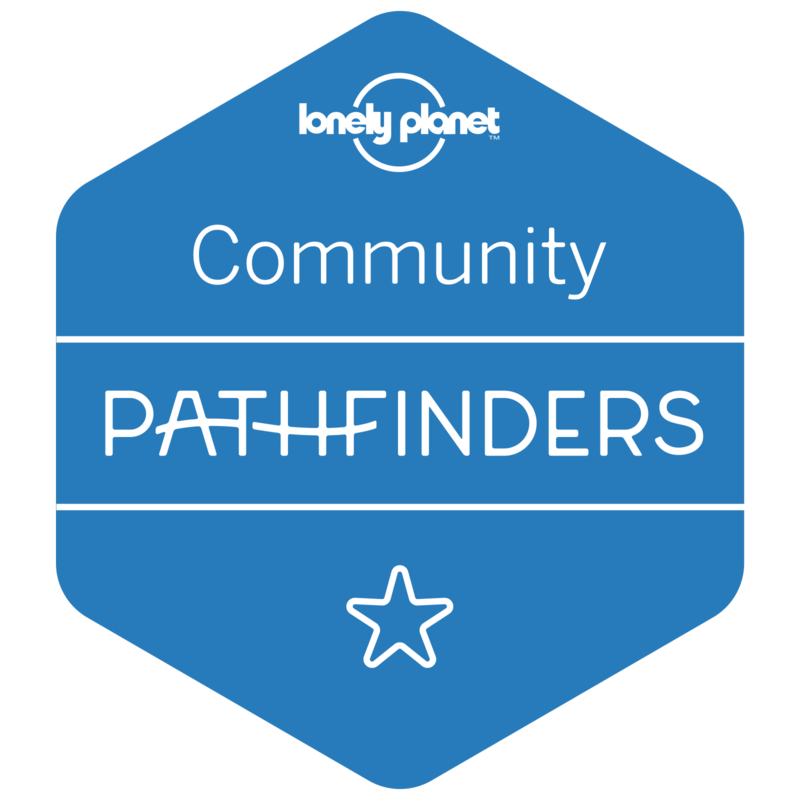 It makes way for a relaxed and restful finale with a little bit of bicycling, shopping and beer-sandwich-ice cream tasting as the locals do. 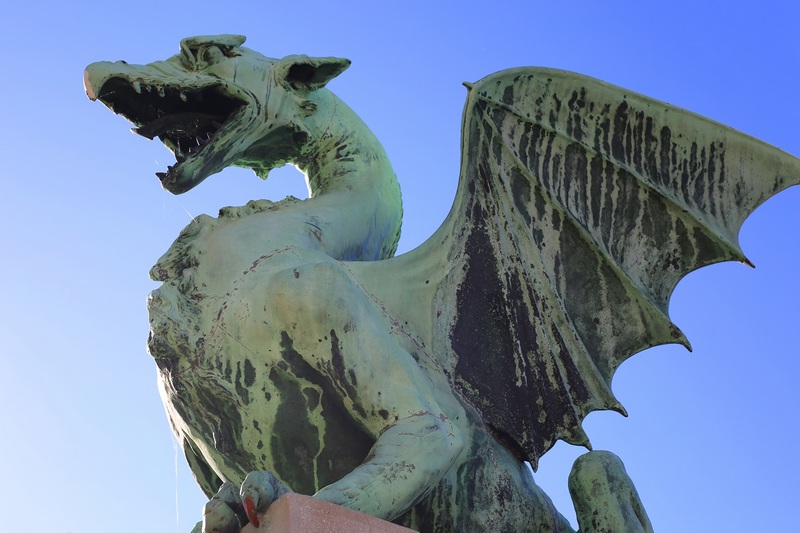 There are three ways to see around the city and its main attractions like the Ljubljana Castle, the churches and the Metelkova District. 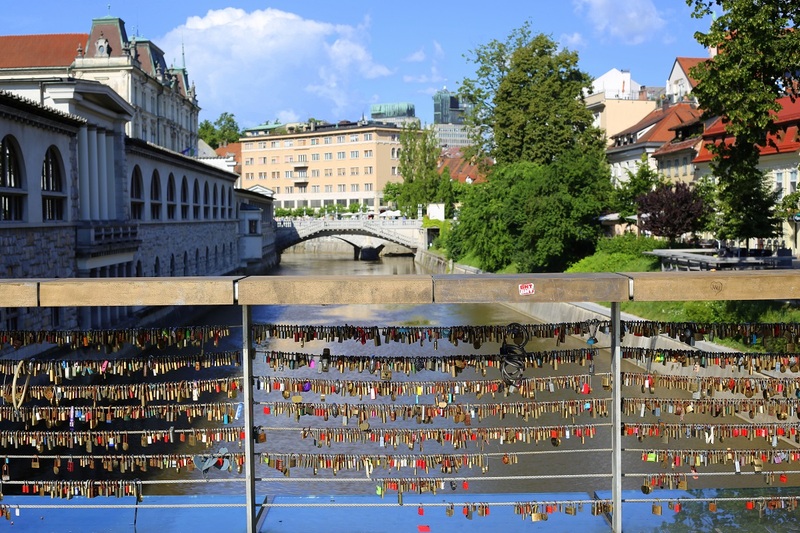 The tourism department which advertises the city as Visit Ljubljana offers walking tours, bicycle tours and a cruise along the river Ljubljanica. All the tours start from one of its two offices, both located in the city centre. On my first day here, I decided to explore the city on my own. I got into the churches which give the city its symbolic outlook. The Church of Assumption with its pink facade seen from a distance along the Ljubljanica is probably the city’s iconic building. The church is situated at the Preseren Square, where there is a statue of Slovenia’s most famous poet, France Preseren. The church and the statue are very close to the triple bridges on the river. The Ljubljana Cathedral is just a stone-throw away from the Preseren Square. If you happen to be in the city on a Friday, don’t miss Odprta Kunha (Open Kitchen) next to the Cathedral. It starts at around 10 in the morning and goes on till 6 in the evening offering Slovenian and some international dishes such as Iranian, Indian and Chinese varieties. I tried Shami, an Iranian dish which is yellow rice with two large beef cutlets and salad with a mix of carrots, onions and mushrooms. Get it with a pint of Lasko, the Slovenian beer. In the afternoon I chose to visit the castle where I got a chance to take a funicular ride to the top. This is doubtlessly the best place to get a bird’s eye-view of the city. After coming down the castle I headed straight to Mestni Trg, again in the city centre, close to the Cathedral. This is one of the several places to relax in the city centre. People usually sit on the benches provided or on the steps around the statue in front of the City Town Hall. 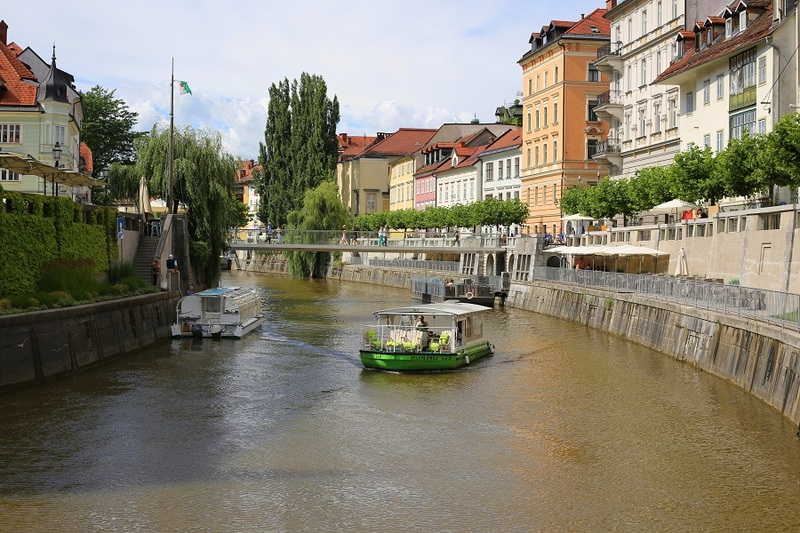 On the second day, I took a bicycle tour of the city provided by Visit Ljubljana. This was when I got a chance to get into the Metelkova City, an autonomous social centre. The place is known for its winding streets which look like abandoned ghost towns where street art wears a gory outlook. The site consists of seven buildings.The squat is named after nearby Metelko Street.There is an art gallery, studio and other cultural centres. The bicycle tour also took me to Tivoli Park, an acres-long green forest with a picnic spot for families. During my final hours in the city, I went strolling along the Ljubljanica and got into one of the many restaurants which line up on both sides. This is where you meet the laid-back and cosy lifestyle of the city. You will be forgiven for joining the many people sitting at the restaurants drinking beer and holding sandwich. Ice cream and gelato are at the entrance to every restaurant. This is a twin attraction in the Karst region of the country. 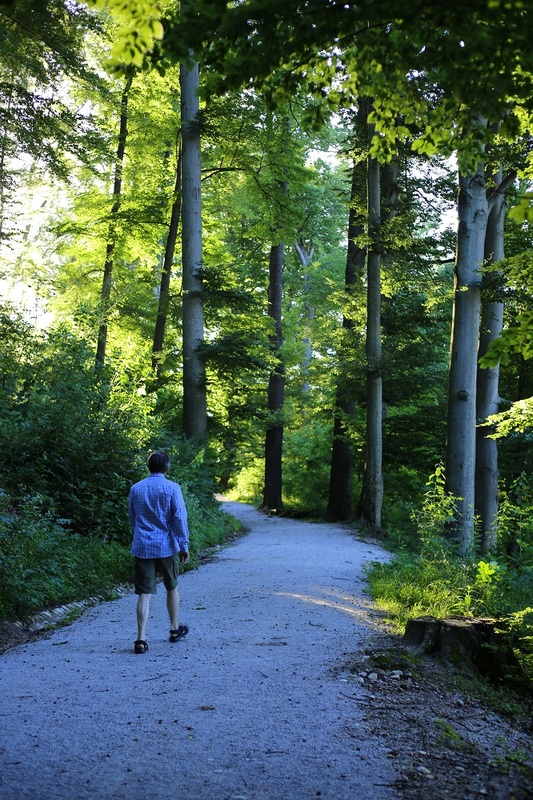 Situated south-west of Ljubljana, both the places can be reached in half an hour to 40 minutes by car. 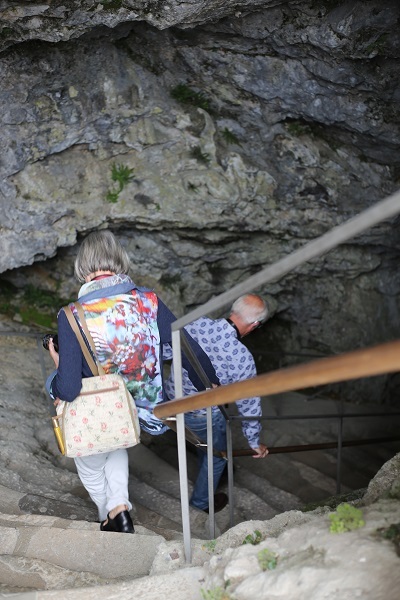 Being close to each other, most visitors combine the two destinations unless they are serious about spelunking in Postojna which can be challenging and can last a whole day. 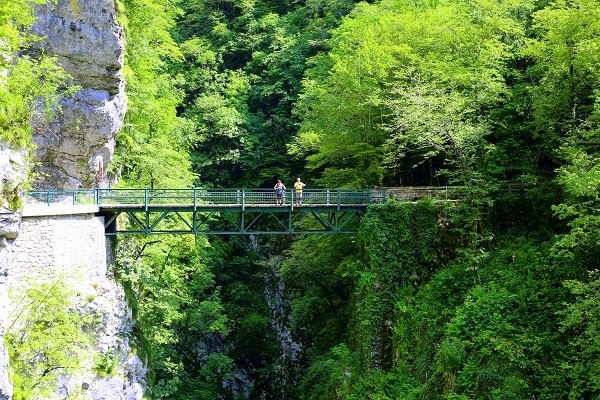 Tourists normally do a train ride inside Postojna for 4 kilometres and trek the remaining 2 with a guide. 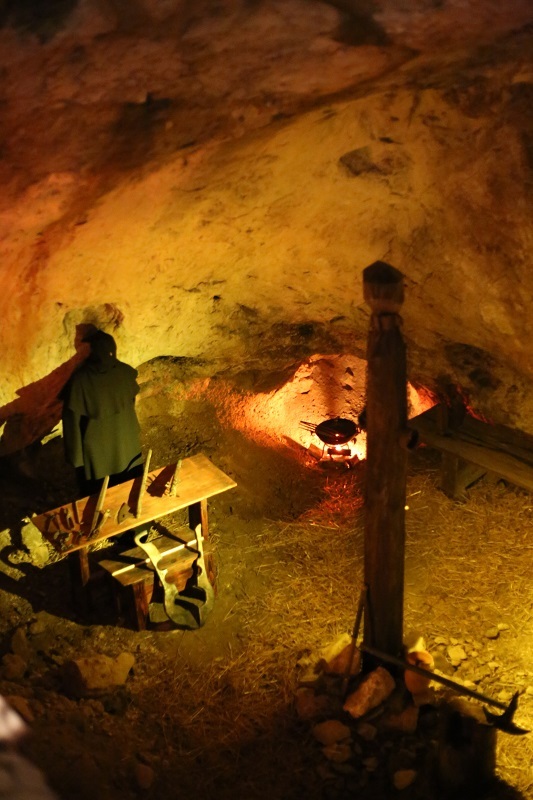 The cave is actually 24 kilometres long and it is possible to access the Pivka river in the underground. This is where the adveturists go abseiling. The train ride is a bit too fast and you may not get perfect chances for photography. The tunnel parts are a bit scary with low ceilings and you get a feeling of getting hit on the head by sharp stalactites. Once you alight from the train the guide takes you around the speleothem of the cave. 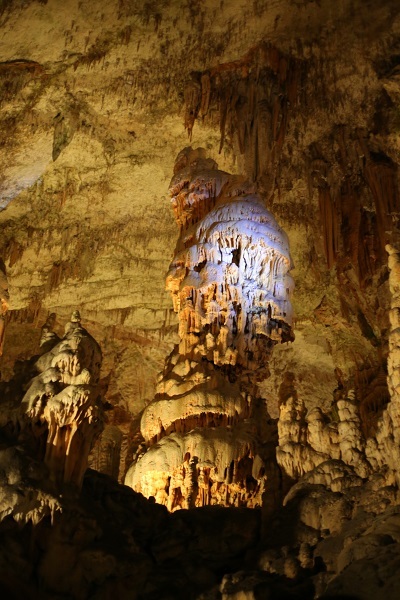 You get to see amazing forms of stalactites and stalagmites of varying forms, sizes and even colours. 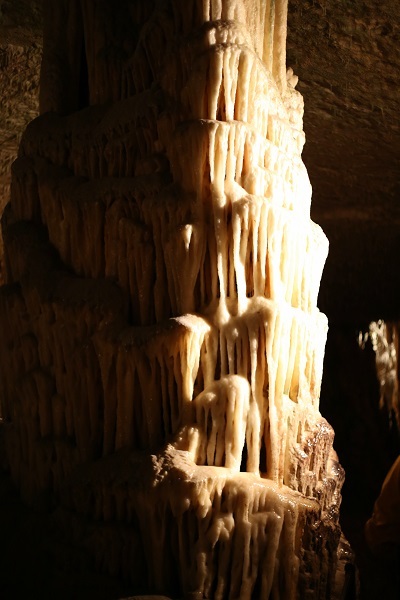 There is a marble white stalagmite which is called Brilliant. On your way, you also come face to face with a gigantic stalagmite (more of a pillar than a stalagmite) which is the tallest in the cave. Other than these natural wonders, one thing that struck me was spotting a crowd in Slovenia for the first time! Nowhere else did I have to stand in queue or jostle for space for photography. The question my in mind was answered by the guide when he referred to Postojna as the most visited cave in Europe. 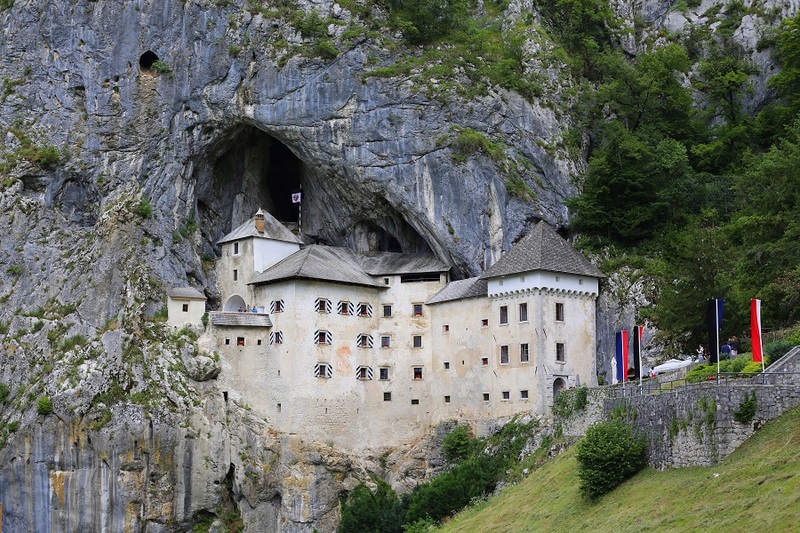 Fifteen minutes drive from here is the legendary Predjama castle which tells interesting stories of Erazem, perfect for children’s bedtime story collection. Erazem was the lord of the castle in the 15th entury and a robber king. When he got into a fight with the Habsburg kingdom after killing one of their commanders he started hiding in the castle until he was killed by a cannon shot. The castle is built in the mouth of a cave and is very photogenic from outside. Several movies including ‘Armour of God’ were shot here. Inside, you get into several rooms and dungeonous cells all reminders of the Renaissance architecture. 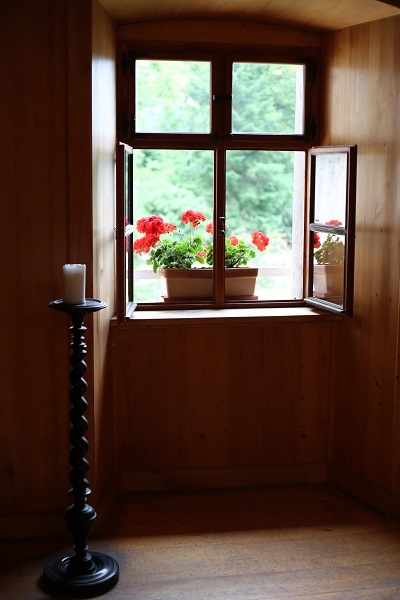 Once you climb to the terrace area where you see the toilet inside which Erazem was shot, you get to see an aerial view of the village of Predjama. 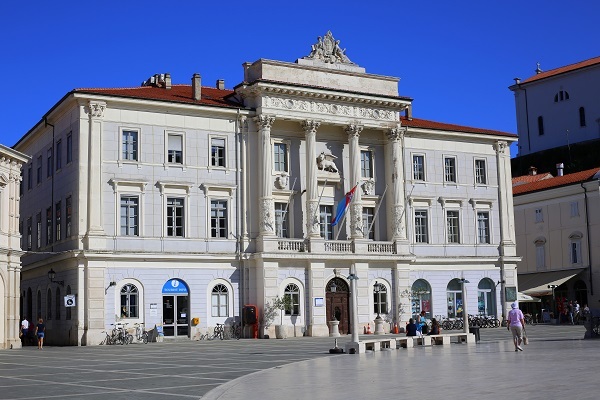 I took a bus from the Ljubljana Bus Station to the port city of Piran in south-west Slovenia, not far from Predjama. The bus tickets are quite cheap (17.50 Euros for a return trip) and seemed to be never crowded. I only had a handful of travel mates in a huge bus on my way to Piran early morning. 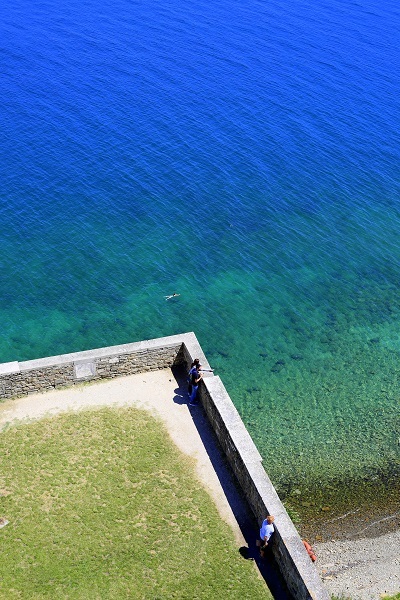 In Piran, you get an Italian vibe surrounded by yachts, buildings with saffron-hued roofs, pristine, translucent water and cafes by the seaside – adding to the touch of Venice, Trieste and the other port cities within the Balkan area. As there is no beach area except for a cobblestoned space tucked away in a corner, the locals use the shallow coral water near the shores as natural swimming pools. Concrete plinths are built on the shores with hand-railed steps leading to the water just like in pools. As the sun gets it warmer, you see the whole space being occupied by families and a few tourists. It would be a good idea to take a vantage point at one of the cafes by this side and have some snacks and beer, watching the beach life and the scores of seagulls flying criss-cross over your head. 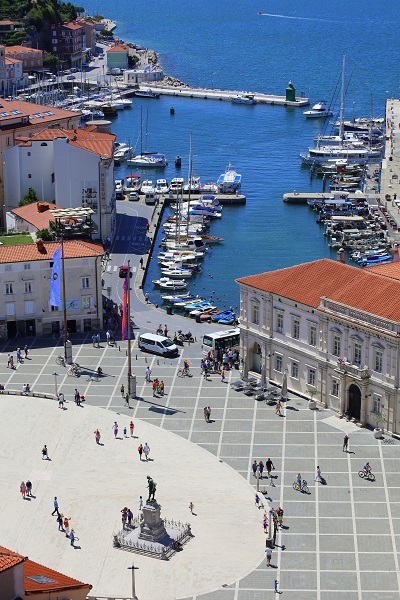 After lunch, get into St. George’s Church nearby and climb to the top of the terrace and have a wonderful view of the port, the sea and Tartini Square of Piran which makes a postcard of Piran. Then take a shuttle bus to the nearby beach area of Portoroz (10 minutes) where the water scene is a bit different from Piran as here we have some sand and play area for children. The beach and café life in Portoroz can be a bit more vibrant than in Piran at times, but may not have an exclusive outlook compared to the latter. If you still have time before taking the last bus back to Ljubljana (unless you are planning to stay in Piran overnight) make your way through the narrow streets near the Piran port. There are some traditional shops here, selling souvenirs. You could also come across family-run restaurants where seafood is served according to your needs. 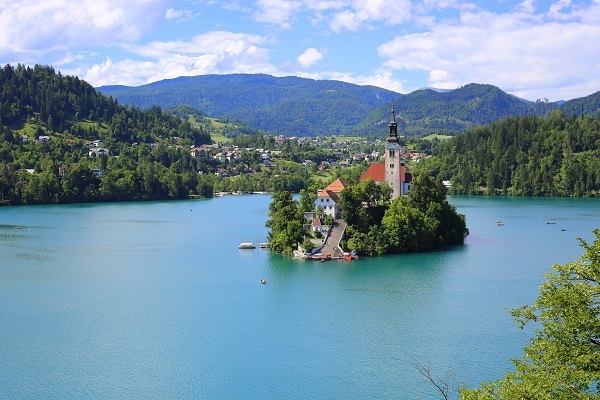 The one place that brings everyone together in Slovenia is Bled. Simply because it has an emerald lake, a church island in the middle of it and a medieval castle on its side. All make up a perfect background for a fairy tale. Also, this is where you may enjoy light to moderate activities without taxing your legs and getting sweaty. Ride a bicycle around the lake which covers 6 kilometres and find different angles to photograph the lake. On your way, meet with sunbathing and swimming tourists, anglers and occasional painters and photographers who can’t get enough out of the dream lake. Take a Pletna (traditional wooden boat) on the lake to get to the natural island and visit the church for 14 Euros. 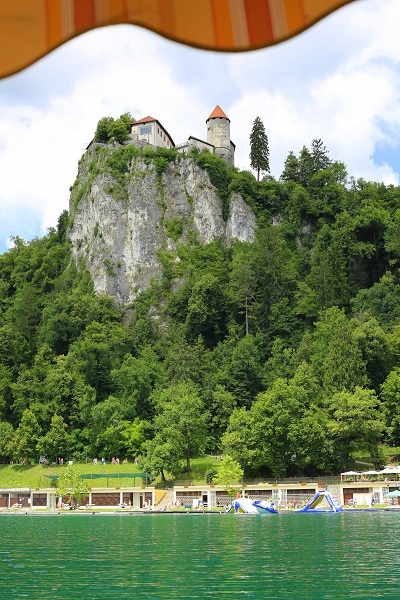 Pay 10 Euros to enter the Bled Castle and occupy a spot next to the wall to have a scenic view of the lake. Don’t miss the Bled cream cake which is a great sale here. Bled is certainly not for one day. 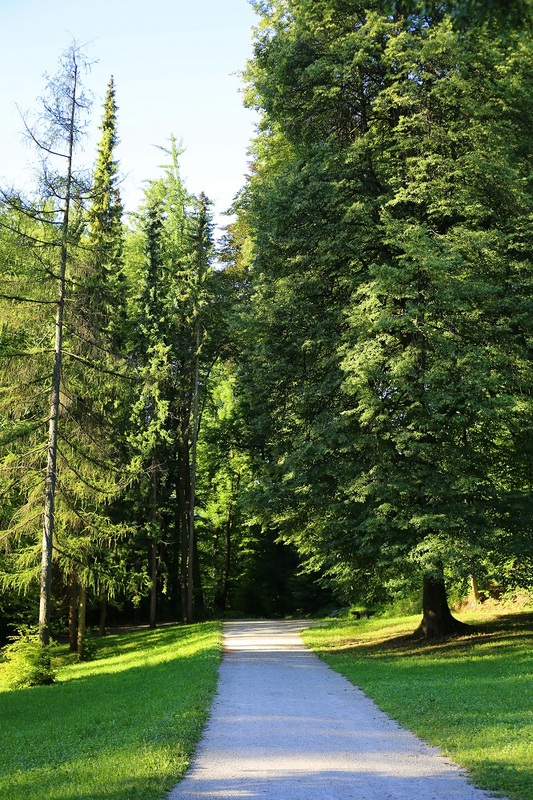 Base yourself here for your next destinations in Soca Valley and the nearby Vintgar Gorge. Vintgar Gorge is a great natural valley by the side of River Radovna and can be accessed on bicycle in half an hour from the town of Bled. 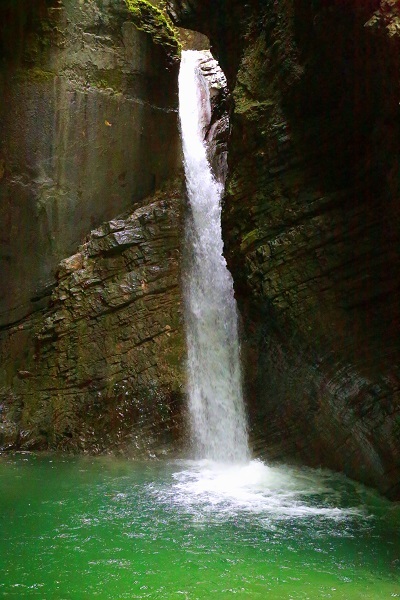 You may trek for about 2 kilometres inside the park before you reach a huge waterfall. If you can’t bicycle, free shuttle bus is available every half an hour from the Bled Bus Station. The ticket costs only 1 Euro one way. I hired a bicycle from a tour agency and had a lovely time passing the villages of Spodjne Gorge and Podhom before reaching Vintgar Gorge. On the way to Vintgar Gorge it was all about cycling the way up so my e-bike was quite helpful. Buses to Bled run every hour from Ljubljana. A one-way ticket costs 6.40 Euros and it takes just about an hour to reach the Bled Bus Station which is just a few metres walk from the lake. Bled is a starting point to your excursions to the Alpine regions of Slovenia. The most picturesque parts of the Slovenian Alps are dominated by Soca River Valley in the Triglav National Park. 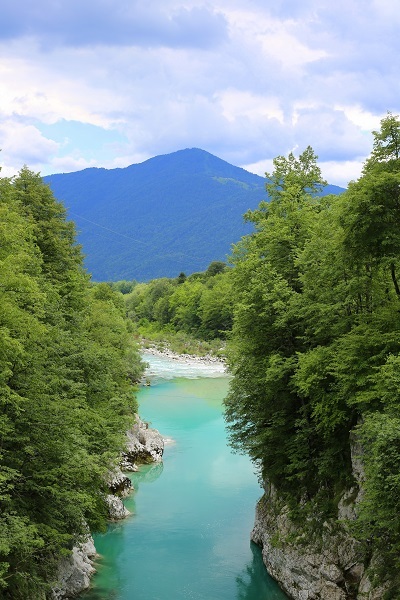 The meandering Soca river is so green in colour that your photos wouldn’t need saturation to enhance the complexion. As you drive along the river, you will meet with several bridges, including the most famous Napoleon Bridge from where you can take photos. My tour to the valley started after driving to Bohinj from Bled. My car mounted an Alpine train and I was taken to a place called Most na Soci in Tolmin in the Littoral region of the country. 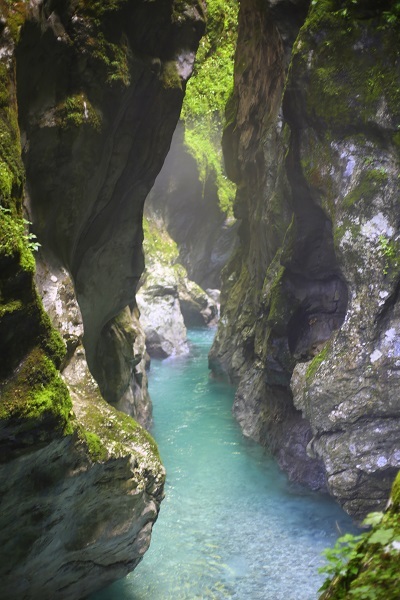 Once I got out of the train, I was driven to the Tolmin Gorge. Here you need to go down hundreds of winding steps after passing along the Devil’s Bridge. The river Tolminka (part of Soca river) gets wedged in by rocky cliffs beneath and it is quite great to spend some time here. Then you make your way up again to drive to the Kozjak Waterfall. The trek to the waterfall is quite interesting, but the space to watch the waterfall, located in a cave, is a bit narrow and you stand on a wooden bridge to view and photograph it. Unless you have plans to take a dip in the pool beneath the waterfall it would be better to give space for other tourists who might be waiting for their chance to get close to the falls. Once I satiated my quest to photograph it, I got back into the car and was driven to the source of the Soca river. To get to the source is not an easy task and it demands a bit of a careful trek up a hill and trudging on a mountain side using fixed ropes. This is not really recommended for children under 10. 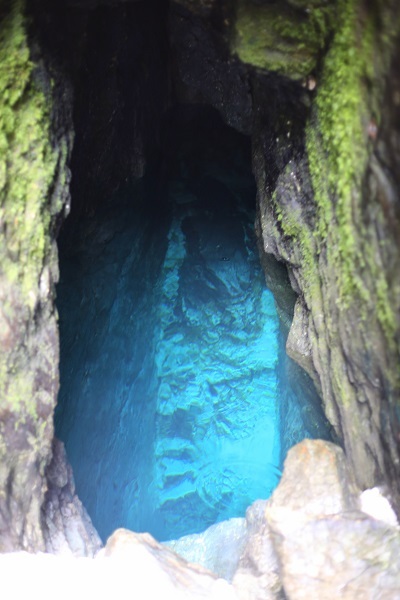 Your efforts are rewarded at the end by the sight of perfectly blue water underneath a cave. The water flows out from here and gets naturally filtered by the rocks. Fill your bottle with ice cold clean and pure water and save it for the rest of your journey. I continued to the Vrsic Pass, the highest mountain pass in Slovenia to be closer to the mountain ranges of Julian Alps. The car stopped here and there to admire and take pictures of the landscape, including the mountain with the Pagan Girl myth. Mt. 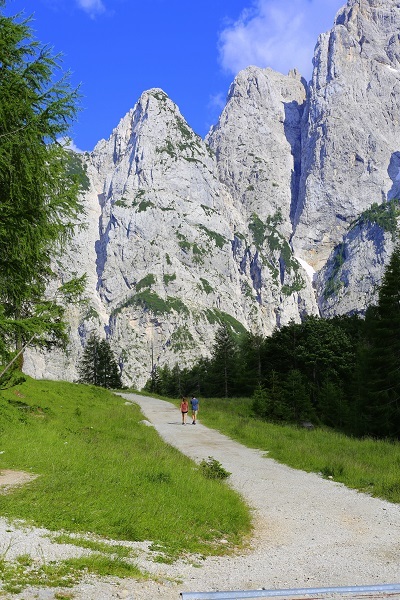 Triglav is close to this place and many travellers climb this to tick it off from their bucket list. I stopped at the Russian chapel while going down the Vrsic Pass. The chapel was built to commemorate the Russian soldiers who fought here during the First World War and built the road on the Pass. 👍 keep up the good work. !